More Than 250 Bodies Found In Mass Grave In Mexico Authorities say they've found more than 250 bodies in what may be Mexico's largest mass grave site. The area has been marred by violence as warring drug gangs battle for control of the state. 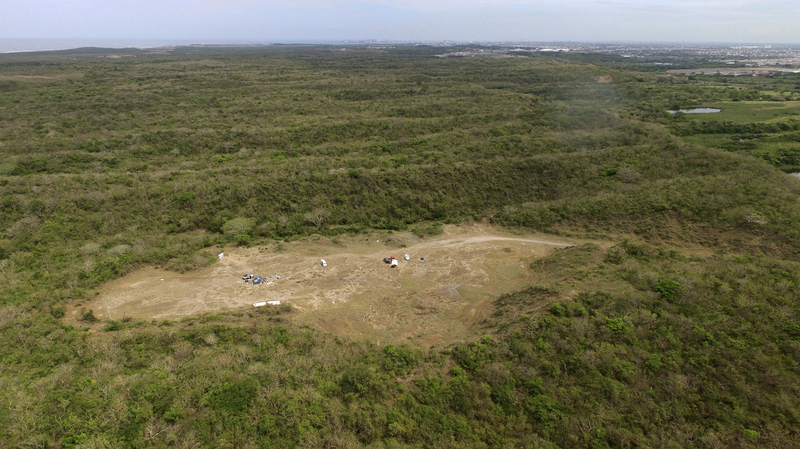 This aerial image shows the area known as Colinas de Santa Fe where Mexican authorities work to find the remains of people buried in mass graves on the outskirts of Veracruz. More than 250 skulls were found there earlier this year in what appears to be a drug cartel's mass burial ground, prosecutors said. Authorities in Mexico say they have found more than 250 bodies in what may be the largest mass grave site in the country. It's located in a dusty abandoned lot just outside the port city of Veracruz. Authorities were led to the graves by a group of mothers who've spent months digging there in search of their loved ones. Of the 252 bodies found in the mass grave, only two have been identified: Pedro Huesca, a young state investigator, and his personal secretary. "My son thought he was going to clean the country of these bad people," says Griselda Barradas, Pedro's mother. "But no, instead they got rid of him." Church bells rang out last night in the family's small town about 40 miles outside Veracruz. Nine days of mourning came to an end with a mass. The pews were full with mothers and relatives of Veracruz's missing — many feared buried in the mass grave. "Finally Pedro is at peace, and his mommy has a place where she can now visit him," says Rosalia Castro Toss. Castro has been searching for her son for more than five years. Frustrated with authorities unwillingness to investigate his disappearance she and other grieving relatives started digging on their own. "This work that we are doing," Castro says, "The authorities should be doing." Veracruz has been marred by violence for more than a decade as warring drug gangs battle for control of the state and its lucrative port. Its past governor, now a fugitive, has been accused of sacking state coffers of millions of dollars, and long suspected of colluding with the cartels. Speaking to reporters at the mass grave site yesterday, Jorge Winckler, Veracruz's new head prosecutor, says it's impossible that this happened without complicity of the state government. Griselda Barradas says she just hopes more mothers find their sons. "Finally Pedro is where he should be," she says, "Resting in peace not tossed in that mass grave like an animal."